Yet these exhibitions brought huge numbers of migrants as well as visitors, creating plentiful opportunities for new businesses and a need for new infrastructure. It gave Melbourne a place on the world stage and was the catalyst for new trade that exposed Australian products to the world. Manufacturers loved these exhibitions because visitors came from all walks of life – and were easily seduced by the glitz and glam of the marketing atmosphere. And people didn’t just go once – there was so much to see, they went as often as they could afford it. For John Twycross, however, the exhibitions meant the opportunity to buy decorator items for his extensive collections. Mrs Twycross must have been a tolerant wife indeed for he not only spent a great deal of money on things that took his fancy, he also built an entire tower beside his house Emmarine to store it all. (Click here to see it). He bought paintings, and statuary for the garden, and vases and glassware and toys and all kinds of stuff too elegant to be called bric-a-brac – and, if the illustrations in this book (and on the website) are anything to go by, it was all in excellent taste. The book includes numerous B&W photos of the exhibits which show pavilions from Germany, France, India and so on, and Twycross bought bits and pieces from almost all of them. There’s a lovely Meissen porcelain plate from the German Court; a stunning French enamel and ormolu mantel clock that our most famous collector of French clocks would probably like to have; and the Venetian and Austrian glassware is to die for. Some of the Asian artefacts must have seemed really exotic then when there was little trade between British colonies and Asia: the Japanese porcelain and the Chinese ivory are just gorgeous. And the best thing is that thanks to the generosity of the Twycross descendants these lovely things were gifted to Melbourne Museum who (unlike some interstate publicly-funded museums I could name) have curated an online exhibition that everyone can enjoy. The book is a treasure in itself. While the authors are both historians with impressive scholarly qualifications, the text is written in a chatty style and it’s enjoyable to read. 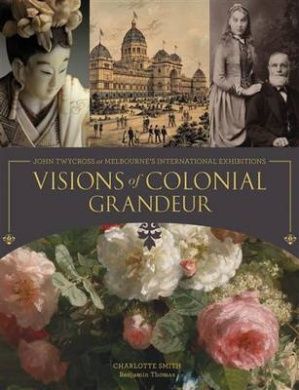 I heard the curator and Twycross’ grandson being interviewed on Books and Art Daily http://www.abc.net.au/radionational/programs/booksandartsdaily/visions-of-colonial-grandeur/5604048 I wasn’t sure if the collection was actually on display at the moment- I could find it as an online collection though. Perhaps the interview was publicity for the book. I must admit that looking at something online isn’t quite the same thing. Oh, I agree, I like to drool over the real thing too. But you know, as a teacher, I’m always looking for resources for students to use, and I really get cranky when public institutions don’t have virtual exhibitions that students can access for research. Not everyone can get to the museum for a visit, sometimes even when they live in the same city it can’t be done. (It costs at least $20 for the bus for our students to go anywhere in Melbourne, even if the entry is free, and some of our families can’t afford that) So I’m a big fan of virtual exhibitions. .
At school, students sometimes tell me about some place selling bargain books, but I always tell them that I don’t want to buy bargain books for them. Their parents can buy the bargain books, I like to buy beautiful expensive books that their parents are unlikely to buy. I’ve just paid megabucks for a stunning pop-up commemorative edition of ‘We’re all going on a Bear Hunt’ and the Preps were enchanted. I like to have gorgeous illustrated versions of fairy tales and fables, and classic myths and legends, and I’m very proud of the picture book collection which is the pride of my library.